It's because many young people don't know about Amway. Or some people are told "it's different now". So they approach it open minded until they find themselves cash negative very quickly and wind up quitting. The approach they use is join Amway where you can make or save money. When you don't know enough about it, how do your argue against making or saving money? When I first saw the presentation, the audience was told that you save abut 30% shopping through Amway. What they don't tell you is that the 30% is full retail price but the wholesale price from Amway was still more expensive that something you can get from WalMart or Target. Satinique anti dandruff shampoo - 2 bottles for $25. 500 ml. Head and shoulders is $5.99 at target. 32 ounces. Two bottles is $11.98. You get more product at less than half the price. A long time back I used some Amway products. I worked for a non profit company and the President of the company made the decision to buy from her daughter who was selling Amway. The company housed inmates out of prison, about four hundred clients, so you can figure the Amway revenue for the Presidents daughter was a bundle. The board of directors put a stop to it, much to costly. I tried some of their products and didn't like them all that much. Nothing I would pay more for and I do pay more if I think a product is better than something cheaper. Amway reps always need to embellish the quality of Amway products or claim they are of great value because of concentration because in the end, you are selling generic quality products at premium prices. The Amway products cost so much because you have layers of upline and downline who receive bonuses so the bonuses are built into the price of the products. For that reason, you will be able to find many examples like my shampoo example where the Amway product cost twice as much as a name brand product you can get at Target. And the name brand product will be significantly cheaper than Amway's. The Amway vitamin prices are ridiculous but they are one of the things that Amway leaders push on their downline because of the point value (PV) that they have. So their training program is teaching them how to scam others. 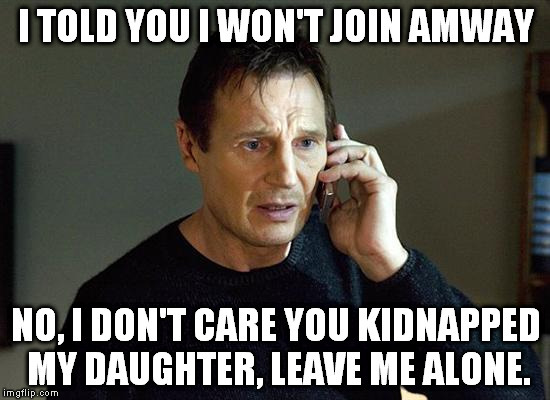 And the irony is that the Amway distributors are recruiting downline in hopes that one day they will become rich from Amway but the reality is they are recruiting customers for the upline's tools and seminars business. The tools and seminars is where the diamonds make significant income, possible exceeding their Amway income in some cases. Well, Joe. I may have to assume control at scam.com again. the AUTHOR of AMWAY is a christian conservative and GOP CONTRIBUTOR!! joe must be crappin his pants about NOW!! he HELPED tRUMP get elected!! oh the IRONY!! And the other irony is Amway operated unfettered under o'bama for 8 years and o'bama did nothing about it.